Notes: I've mentioned before that the cable decreases around the neck are wrong. Susie Cupcakes had noticed this too, and I agree with her that the cable trim really doesn't look like the picture in the magazine. I wrote to VK about this, but no word. I used size #3 needles for this, which are the smallest needles I've used to date. I had messed up the back piece and had to recycle that yarn, which resulted in some even worse unevenness than I tend to get when I knit flat. 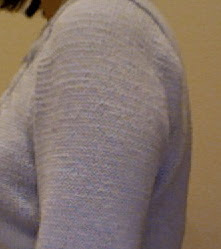 I will say, though, that my purl rows are starting to be a bit less loose and a bit more even. This was also an opportunity for me to practice my finishing techniques, and I checked out Sharon Brant's book from the library for help with this. I'm pretty comfortable with mattress stitch now. 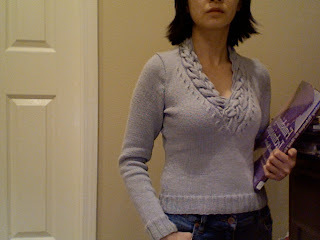 Overall, the sweater turned out okay, but I can't say that it will be my favorite. For one thing, it keeps riding up in the front. I think this is in part because the back neck is too shallow. For another, I'm not thrilled about how the sleeves turned out. This is one of the areas that I used recycled yarn because I was running low and there is a lot of "rowing out." Setting the sleeves in is still difficult for me, even after reading the book and several internet tutorials. Also, the sleeve cap is too big, even though I resized the entire sleeve porportionally. See the extra poofiness in the back? I'll see how it turns out after washing again. After that, I don't know--I'll either decide to let it go, or I might resew it, or I'll have to start working out to build up my deltoids and triceps! It looks really gorgeous! I love the color. The yarn should settle in on the arms after a hand wash or gentle cycle in the washer. That is just gorgeous! Wonderful work!